Teresian Carmelites in India dispatch first group of sisters to U.S.
WASHINGTON (CNS) — A small group of Teresian Carmelites from India are quickly adjusting to their new life in the Diocese of Bismarck, N.D., helping out in the Catholic Indian Mission and teaching at St. Bernard Mission School in Fort Yates. There are four of them, and this is the first time members of their congregation have lived and served in the Western Hemisphere. Their order, founded in 1866, is based in Kerala, India. The sisters have come in place of the School Sisters of Notre Dame, whose numbers at the school were declining. Feeling that they could not adequately maintain staff, the School Sisters put in a year’s notice they would be departing. 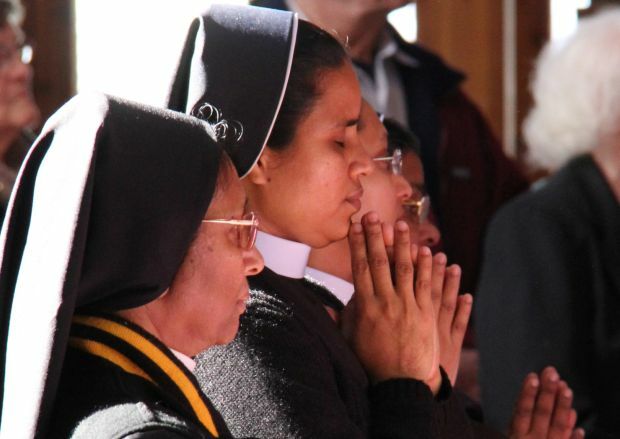 In searching for a replacement, Father Biju Chitteth, an Indian priest in western North Dakota, connected with the Mother Liza of the Congregation of Teresian Carmelites. Father Chitteth told Bishop Kagan, who then invited them to serve. Mother Liza officially established the order’s U.S. presence during a Feb. 22 Mass at the Church of St. Peter in Chains in Fort Yates. The sisters moved into St. Bernard’s Carmel Convent, which sits on the property of the church. One of the Carmelites, Sister Silvin, said it was God’s will they came to North Dakota. There are five parishes in the Catholic Indian Mission, Bishop Kagan explained. The sisters’ main duty will be to teach at St. Bernard Mission School, but they will also assist priests from these five parishes in pastoral work. Fort Yates is a part of the Standing Rock Indian Reservation in North Dakota. The city has a 92 percent Native American population, according to the U.S. Census Bureau. St. Bernard Mission School, which was established more than 100 years ago and has always been staffed by religious sisters, strives to help its students “have better lives without taking away their identity,” Benedictine Father Basil Atwell of the Church of St. Peter said. He stressed the importance of respecting the students’ Lakota heritage. After morning prayer and the Pledge of Allegiance, the students drum and sing in Lakota. Even though they speak English, the Teresian Carmelites have had to adapt to the people’s Lakota dialect. But this language barrier has not hindered their effect on the students. “(They are) a great example to the young people, especially the young women,” Bishop Kagan said of the sisters. He said young women have already requested to sit down and ask them about their life and customs. “They’re curious, if not fascinated, that (the sisters) would travel 8,500 miles to come to North Dakota (and serve),” he said. Bishop Kagan laughed and said it might take them another year or two to get used to the winter. Other than that, they have gradually adapted to an American routine, he said. They even obtained driver’s licenses. Father Atwell said he hopes to learn from the sisters’ culture as much as they hope to learn from the American culture. Already, he has learned a lot. According to an article on the website of the Diocese of Bismarck, the order hopes to stay long-term and recruit more sisters. Bishop Kagan plans to bring in four more Teresian Carmelites and possibly establish a house in Dickinson, Father Atwell said. Here, the sisters will take in American novices, who will become the first U.S. members of the Congregation of Teresian Carmelites. could you please pray for my relationship with god and my relationship with all of his children that do not hapte god. but i wish for the true realith that you could pray all relationships with all of gods children and all of us.